Shared Scooters May Be Fun, But Are Riders Safe? 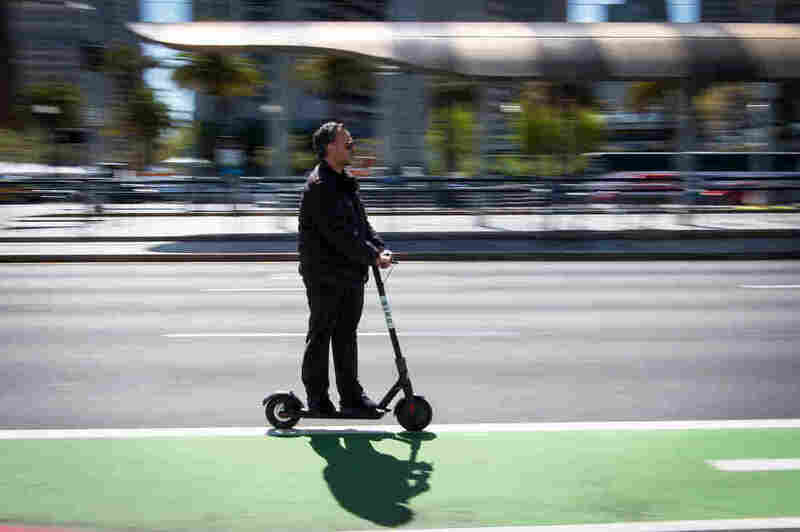 : Shots - Health News Electric scooters zoom through traffic in many cities these days, and have the potential to take cars off the road. But experts worry that the many riders who forgo safety gear are taking big risks. Shared scooters and bicycles are spreading to several major U.S. cities while policymakers are scrambling to find ways to ensure that riders are safe. Over the past year, companies have been rolling out electric scooters by the thousands in cities across the country — from Milwaukee to Washington, D.C., to Lubbock, Texas. People download the app, find a nearby scooter and then just unlock and ride. But as these shared scooters have spread, so have concerns about safety. Portland, Oregon, is in the middle of a four-month e-scooter pilot program. You see these scooters everywhere — parked on sidewalks (they don't require docking stations, which most shared bikes do), taking fast corners and zipping through traffic. But something you don't see much of: helmets. On a recent weekend, a 32-year-old woman who didn't want to give her name because she's breaking the city's helmet rule is riding for the first time with some of her friends. None of them are wearing helmets, which both the city and the scooter company require — with good reason. "One of our friends almost just got run over. The brake lights on theirs don't work," she says. Part of the draw of these scooters is their flexibility — most riders we talked to hopped on a scooter on the spur of the moment. And, given the fact that most people would not want to share helmets with strangers (nor could integrity and safety be ensured if they did,) they don't come with helmets attached. So people end up riding without any safety gear. Yes, this is against the rules, but many people just don't want to carry around helmets. Data from bicycles suggest that people participating in share programs have lower rates of accidents than those using their own vehicle. And many transportation advocates point to the fact that helmet requirements deter bike usage. Still, helmets provide protection. Riding a scooter is very different from riding a bike. They accelerate without you pedaling, have a different center of balance and take some getting used to — for both riders and the cars driving around them. And people on e-scooters are starting to show up in emergency rooms with injuries. "We've seen things from broken bones to punctured lungs to shattered pelvis," says Catherine Juillard, a trauma surgeon at Zuckerberg San Francisco General Hospital and an assistant professor at the University of California, San Francisco. While many cities are collecting transportation injury data, San Francisco is taking a comprehensive, science-based approach through its Vision Zero SF Injury Prevention Research (VZIPR) Collaborative. Juillard is a member. The collaborative aims to standardize data collection and work with the city to get a fuller picture of exactly what these injuries reveal. Are they happening at particular intersections, are people fracturing skulls or spraining ankles, or are some types of scooters more dangerous than others? And based on that, they'll figure out the next steps. Other cities are watching closely. "Technology and disruption — when they enter the sector of transportation, [they're] also entering the sector of public health. So it becomes a different ballgame, and we need to make sure that we're doing it safely," Juillard says. California has welcomed e-scooters — even changing the law so adult riders don't have to wear helmets. Whereas other places, like Seattle, are so concerned about injures that they're not allowing e-scooters at all. As a trauma surgeon, Juillard has seen the dangers. But she also sees the potential — because San Francisco is a city dealing with a lot of car traffic. And so is Portland. "We're going to have many more thousands of jobs, many more thousands of residents — we're not going to be building many more thousands of streets," says John Brady, spokesman for the Portland Bureau of Transportation. To continue to have a city that works — that moves — Portland wants to welcome innovation. Knowing you can just hop on a scooter for a few bucks might encourage more people to leave their cars at home. But Portland wants to make sure these innovations meet all of the city's transportation goals: moving people efficiently, cutting emissions, and making each trip as safe as possible. "If at the same time we're seeing a rise in injuries, but we also see that people are getting out of their car and potentially helping to relieve congestion, is that a trade-off from a public agency standpoint that we think is a good one? I don't know. And we don't know yet," Brady says. Portland, of course, does not want a rise in injuries — they're handing out free helmets and conducting a public education campaign. Brady says the city has given out about 500 helmets (the city currently has 2,000 scooters on the street.) And the scooter companies are working on distributing free helmets across the country — both directly on the streets in the cities they serve, and through mail-in programs. Bird scooter company reports distributing more than 50,000 helmets, and Lime (which also offers dockless bikes) reports having distributed tens of thousands of helmets. But you only have to look at the scooters zipping by in the street to see that this is a big change in how people move around in a city. Cars and scooters are still learning how to be around each other, and not many people are wearing helmets. Cities and physicians will get a better sense of scooter dangers as the data come in over the next few months. In the meantime, scoot safely. Or you could always walk.